“Now, we come here, right at the start, to an extremely important principle, which is the different points of view you get when you change your level of magnification. That is, to say you can look at something with a microscope and see it a certain way; you can look at it with the naked eye and see it in a certain way; you can look at it with a telescope and you can see it in another way. Now, which level of magnification is the correct one? Well, obviously they are all correct. They’re just different points of view.” Alan Watts, The Universe of Everything. Working with scientists from STFC RAL Space in Oxfordshire, video artist Tal Rosner, composer Daniel Wohl and a cast of seven dancers, Alexander Whitley has created 8 Minutes – the time it takes sunlight to travel 93 million miles to the earth. A subtle flickering of soft lights illuminates seven dancers as they tremble into motion. As though particles that are gradually heated, the dancers carve weaving pathways through space using their arms as though weightless, punctuated by brief moments of resistance. 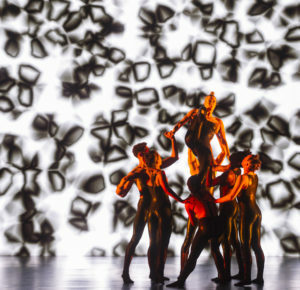 Energy is transferred from one side of the stage to another, before the dancers connect in spirals – engulfing one another. Alexander Whitley Dance Company, 8 Minutes. The piece is satisfying to watch. Whitley choreographs distinct lines and shapes in space, utilising the dancers’ strong technical grounding which together with interesting contact work, look stunning against Rosner’s video designs. The score by Wohl compliments the scientific processes 8 Minutes examines, with further connections made by voiceovers, including the above extract from Alan Watts’ The Universe of Everything. Later, the dancers movements develop past abstraction to show human gestures, fast-forwarding through daily life. Tia Hockey has a dynamic solo that draws on her impressive, gymnastic-like flexibility – moving in and out of the floor with surprising speed and agility. 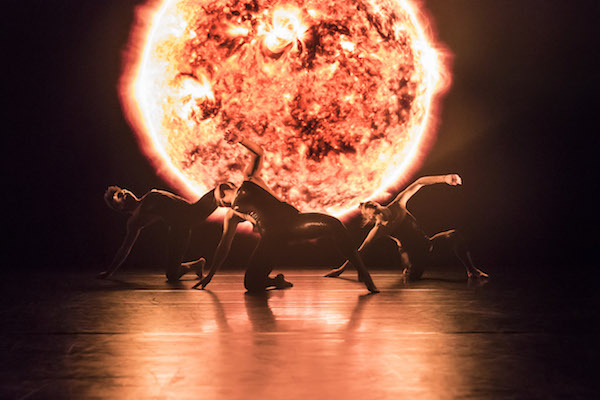 The final section uses actual footage of the sun, whose molten surface expands across the screen, leaving the dancers as silhouettes to retrace steps from the opening sequence. 8 Minutes is visually stunning, has excellent collaborators and is an enjoyable watch. I’m uncertain whether I will remember the work in a few months time, and am not convinced it had an effect on me as I would usually hope performance to do – but I am glad to have seen it, and am curious to know how Whitley’s choreographic approach will develop from here. 8 Minutes embarks on a UK tour this Autumn.